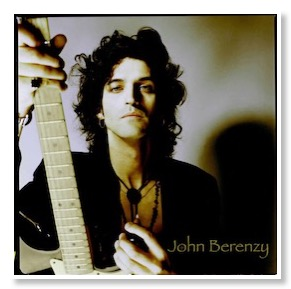 With a career in music making and poetry that spans more than four decades, artist John Berenzy has cultivated the ability to create light out of darkness and wholeness from fragments, and with a musical palate encompassing everything from classic rock to classical. The Queens, New York native and contemporary bard of the blues was recently interviewed to talk shop on song crafting, poetry spinning, and making it as an artist. Nori Hubert: You’re originally from Queens and grew up around people who actually made music for a living (or lack thereof). How did this contribute to your own identity as a musician, as well as your perception of music’s role in the modern world? 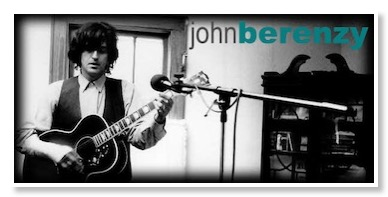 John Berenzy: The musicians that I grew up around both, locally and professionally, were a big influence on me. When I was young, I listened to hard records my grandfather and parents had: Orchestral, Jazz, Blues, Supper Club Pop, Stage play, Novelty. Music in the street was an everyday event too. I heard Eastern European, Latin, Asian, African. It was a cultural basket of delights. You’ve worked with a number of guitar legends, from Santana to David Bowie to Patti Smith. Who would you say are your biggest influences? DJango Reinhardt was an early favorite. He was aggressive yet tender and despite his compromised left hand, he was quick witted and imaginative. Robert Johnson, the legendary blues acoustic guitarist, was a great solo self-accompanist and singer songwriter and I learned a lot about counterpoint rhythm and singing over intricate guitar parts from him. Bob Dylan was a huge influence in regards to lyrics and the importance of getting inside a song. He taught me to be myself. The Beatles and The Rolling Stones were the yin & yang of early rock n’ Roll and got me to research their influences and, therefore enlarge my musical vocabulary. Jimi Hendrix exploded in the sonic capabilities of the guitar and got me to hear things not previously explored. David Bowie taught me how to create art as a persona and brought a cool humanness to experimentation and he looked great, ha ha. Miles Davis, the great Jazz trumpeter, taught me to respect space and phrase in a cool way. I learned about modal playing from him and a respect for experimentation. In Classical, Samuel Barbers, "Adagio for Strings" pulled at my very being, as did Gorecki. Classical music taught me how to layer different guitars as melodies, Jazz taught me improvisation, and Blues Country and Soul taught me how to keep it real. Reggae also was integral for undulated rhythms. I should mention that I get a lot of ideas from fine art and architecture. A lot has changed in rock and roll since the 1970s, especially since many of the Greats have passed away in recent years. Do you think rock has lost its original spirit, or has it simply evolved for a new generation? Technology has made it easier to sound perfect which has rendered a lot of music soulless and disposable. I like to hear people reaching for the stars even if it's not technically perfect. Music will continue to evolve as long as people live. In addition to music, you’re also a published poet. Can you speak to how poetry and music feed each other, and your experience in creating both? Poetry is the language of dreams. It says a lot in sometimes a few lines. It defies logic, space and time and saved my life from banality and advertising. It's the highest rung on the ladder. What does the songwriting process look like for you? The songwriting process for me can start with a one word concept or story like a play. Characterization and the staging become an arrangement. Sometimes it's a chord or a riff. Do you have a favorite album or poetry collection that you’ve created thus far? I always am drawn to the most recent work in my catalogue. When I venture back through all the songs my mood governs what I'm drawn to. "Evolve" was my first book of poetry and "Blood of the Rose" is my second, but I need a publisher to continue. Any current projects you’re working on? I have just started a new album with the working title of Forevermore. What advice would you give today’s young artists trying to make a name for themselves? My only advice to young people as artists would be to be your honest self as you continue to change and evolve. As Woody Guthrie once said, "Take it easy, but take it."